3 [[underline]]CHICANO INSTITUTE ON LAW AND JUSTICE[[end underline]] Armando Almazan A national conference on the Administration of Law and Justice and the Mexican American was held at Phoenix, Arizona from August 31 through September 2. The conference was sponsored by the Mexican American Legal Defense and Educational Fund, San Francisco, Califas. 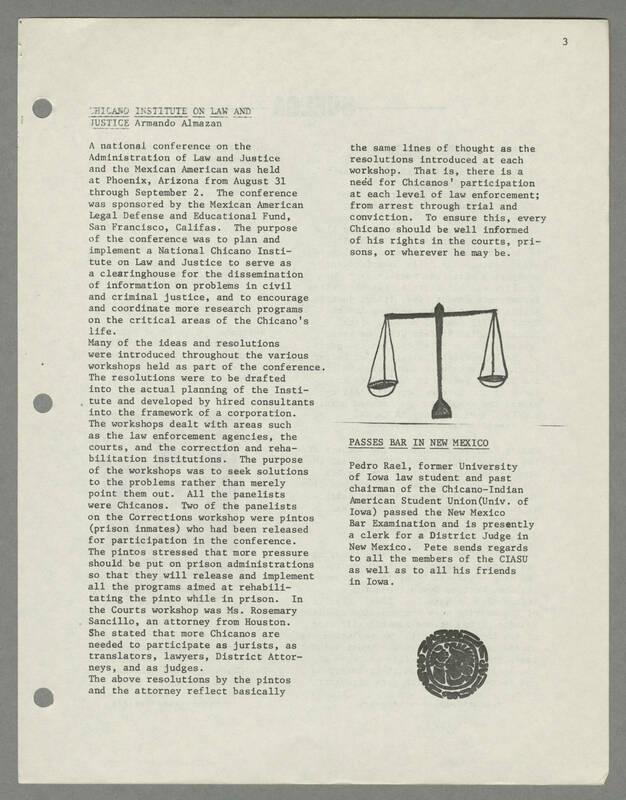 The purpose of the conference was to plan and implement a National Chicano Institute on Law and Justice to serve as a clearinghouse for the dissemination of information on problems in civil and criminal justice, and to encourage and coordinate more research programs on the critical areas of the Chicano's life. Many of the ideas and resolutions were introduced throughout the various workshops held as part of the conference. The resolutions were to be drafted into the actual planning of the Institute and developed by hired consultants into the framework of a corporation. The workshops dealt with areas such as the law enforcement agencies, the courts, and the correction and rehabilitation institutions. The purpose of the workshops was to seek solutions to the problems rather than merely point them out. All the panelists were Chicanos. Two of the panelists on the Corrections workshop were pintos (prison inmates) who had been released for participation in the conference. The pintos stressed that more pressure should be on prison administrations so that they will release and implement all the programs aimed at rehabilitating the pinto while in prison. In the Courts workshop was Ms. Rosemary Sancillo, an attorney from Houston. She stated that more Chicanos are needed to participate as jurists, as translators, lawyers, District Attorneys, and as judges. the above resolutions by the pintos and the attorney reflect basically the same lines of thought as the resolutions introduced at each workshop. That is, there is a need for Chicanos' participation at each level of law enforcement; from arrest through trial and conviction. To ensure this, every Chicano should be well informed of his rights in the courts, prisons, or wherever he may be. [[underline]]PASSES BAR IN NEW MEXICO[[end underline]] Pedro Rael, former University of Iowa law student and past chairman of the Chicano-Indian American Student Union (Univ. of Iowa) passed the New mexico Bar Examination and is presently a clerk for a District Judge in New Mexico. Pete sends regards to all the members of the CIASU as well as to all his friends in Iowa.